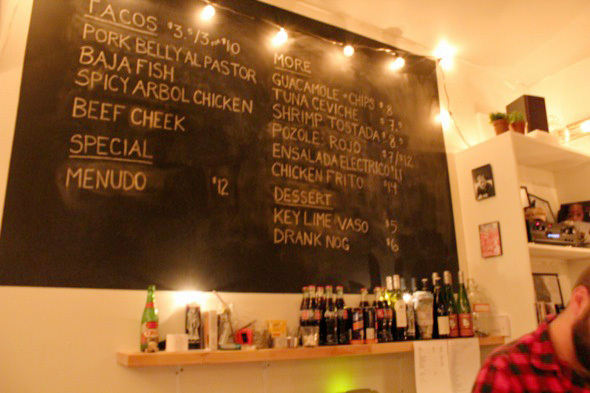 Grand Electric has Torontonians flocking to Parkdale to sample the powerful Mexican flavours, absorb the pulsating rhythms and imbibe in brown-hued liquor. The brainchild of former Black Hoof 'ians, Chef de Cuisine, Colin Tooke and front-of-house Manager, Ian McGrenaghan, scores of committed customers will wait for 1-3 hours to pack the place from 6pm 'til late, Wednesday to Monday. As their answering machine will tell you, "We don't take reservations and we're closed on Tuesdays so we can get drunk". 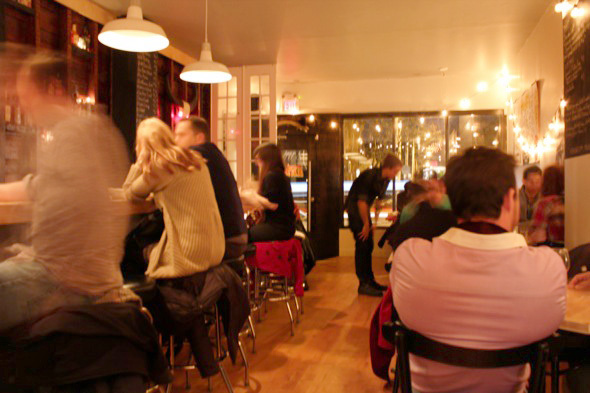 Unpretentious, yet accommodating in their personal approach, get your name on Ian's list and go for a brew down the street--it's well worth the wait. Stationed at the long slate-top bar, I'm staring at the lengthy and collection of Bourbon, seldom matched in the city. Hand-selected by the scotch-converted palate of McGrenaghan, he promised me he'd change my perspective on the burly liquor from the South on a night when I wasn't driving. There's also some interesting Rye on the list if that's more your thing. And If you don't dig these types of distilled beverages, try a Michelada (the ceasar of beers) made with Tabasco, lime juice, salt, pepper and Maggi. 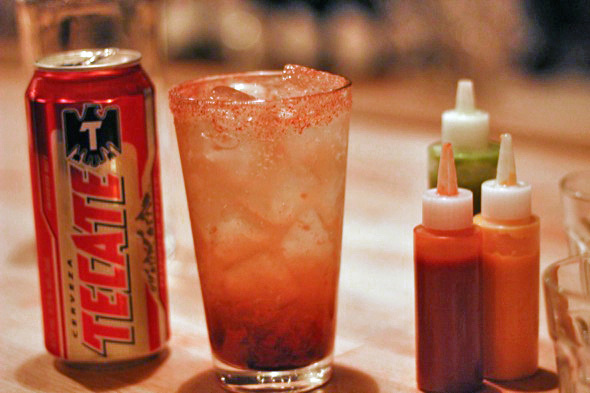 Or sip on Horchada, an icy rum cocktail made from arroz con leche (Mexican rice pudding). Three intriguing condiment bottles adorned the bar-top: a housemade, tangy, cool salsa verde made from green tomatillos, a crimson Mexican hot sauce called Valentina and a beautiful, bright orange bottle of hot sauce that came straight from scotch bonnet heaven. My friend commented on the selection, saying, "it took all of my willpower not to put those in my purse and take them home." As far as vibe goes, Grand Electric lives up to its name with a loud room of engaged diners who chat over the sound of some pretty decent hip hop. Lost Boyz, anyone? While the ambiance and selection of sauces is always important, I was there for the food — and the food, my friends, was really good. 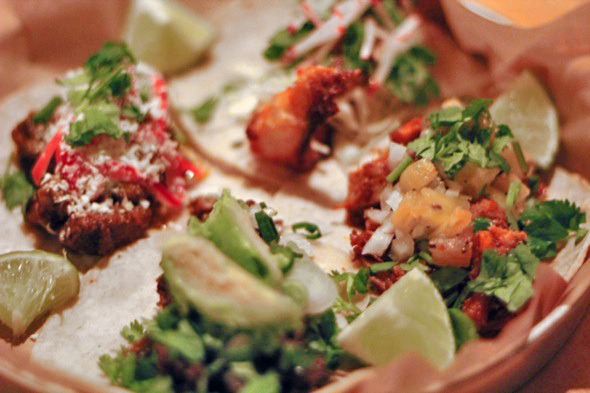 We started with a satisfying selection of tacos ($3.50/3 for $10). Pork Belly al Pastor was brightened up by the sweet hit of pineapple, Baja Fish, made with light pieces of fried tilapia, and Spicy Arbol Chicken was salty and rich in smoky arbol chili flavour with an acidic bite from encurtida onions. Finally, the Beef Cheek was saucy and tender, akin to a pulled brisket but significantly more rich. Topped with coarse cut cilantro and a zesty squeeze of lime, the tacos were ideal for testing out the tantalizing variety of sauces. Next course was a Tuna Ceviche (lead photo), untraditional in my experience but clean in appearance and taste ($7.50). You could pick out each individual ingredient — well-marinated chunks of supple tuna, mounted on a fried tortilla. Fresh rounds of green chili added heat, julienned radish, while crispy fried shallots and sparkling citrus and yuzu mayo rounded out this refreshing dish. The main attraction was the day's special — Menudo ($12). 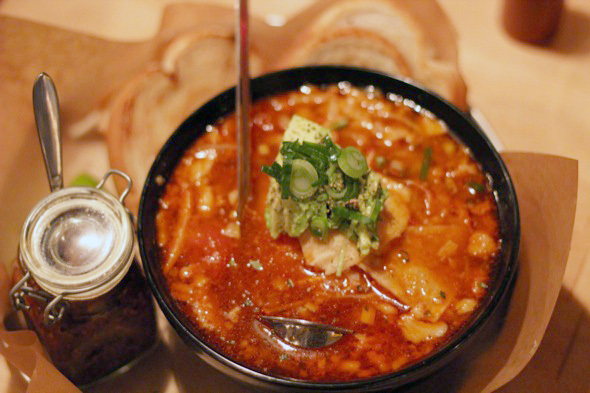 Similar to their standard Pozole Rojo, a must try according to Tooke, Menudo is a type of hearty soup/stew. The dark burgundy broth made from tripe and pork bones, onion, guajillo and arbol chilies acts as the ideal stewing agent for spoonfuls of sweet beef tripe, salty chorizo sausage, and roast pig skin. With fresh avocado to garnish, a squeeze of lime, and (why not a little more spice?) a healthy dollop of handmade pickled chili condiment, I mopped up every last drop in the bowl with the side of veal marrow-topped bread. Too full for dessert, I'm nevertheless content. Life is wonderful, and one is sure to be well fed when Grand Electric is making the menu.